I first saw Titian’s Flaying of Marsyas in the winter of 1984. 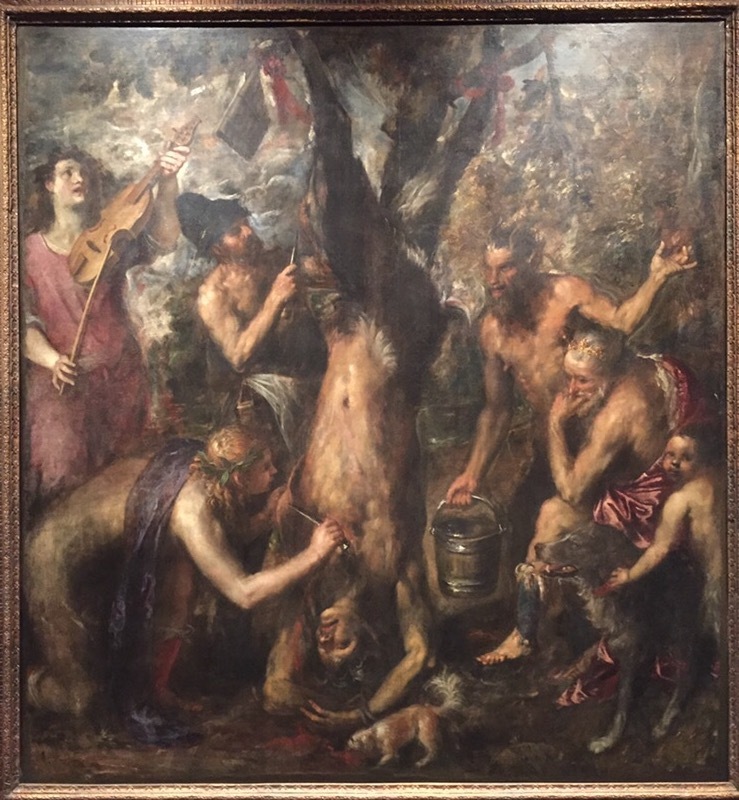 I had moved to Brooklyn from the Bay Area just 5 months before, when I heard the Flaying of Marsyas was at the Royal Academy in London for an exhibition on 16th Century Venetian painting. I quit my job, got a cheap flight and flew over. I had been looking at this painting in a beaten up old art book for several years and so I was duly prepared for the gruesome yet strange calm of the image, the intense frontal geometry and the V shapes that dominate the picture. What I wasn’t prepared for was the emotional impact this painting had on me, it was quite unlike anything I had felt up to that point, and at the time I don’t think I could have described exactly why. I was completely overwhelmed. I spent five days with that painting, transfixed. Since that time the Flaying of Marsyas has traveled every few years for exhibitions all over Europe and America and I’ve seen it in four more venues, in Washington, Paris, Vienna and, most recently, at the Met Breuer this last summer. The experiences I’ve had with the painting after that first week in 1984 have ranged from curious to perplexed to admiring, but I somehow couldn’t recapture what I guess was a kind of first love feeling I had had in London in 1984. That is, until The Met Breuer show where, after a disappointing first viewing, I somehow powerfully reconnected to the picture in numerous visits in the subsequent months. In the last days of its time here, after hours with it, I couldn’t tear myself away. As we know from research done for the 1984 exhibit, the painting might reflect a contemporary event in Venetian military history. A famous Venetian admiral had been flayed alive in the war with the Turks in the 1570s, and perhaps this prompted Titian to revisit a composition that he had made years before. But contrary to the sensationalism of the barbaric reports received in Venice, Titian has drained most of the drama and all of the theatricality out of the event. The flaying has become ritualistic and there is a mesmerized quality to the action. There is an extreme frontality to the painting, everything is pulled up so close to the picture plane; meanwhile the overall quality of the fracturing of form and color disperses energy, and an ethereal light dances across the surface. The landscape that is emerging between the figures refuses to sit back in space- the air seems absolutely as volumetric as the figures and is also pushing towards the surface. Titian allows you to tightly circle around Marsyas but he does not allow you to easily move into and rest in the deep space of the landscape- you are continuously pulled back to the picture plane by the density of the space and the intense compression that he is creating. And so you are continuously thrown back to the central event – of this strange elongated upside down creature being tortured, and all these Vs of arms, a perfect pacing of Vs, some more narrow, some widened, which for me becomes this wild creature, all these arms made up of 5 figures but combined into one crazy zigzagging form running straight through the center of the canvas. 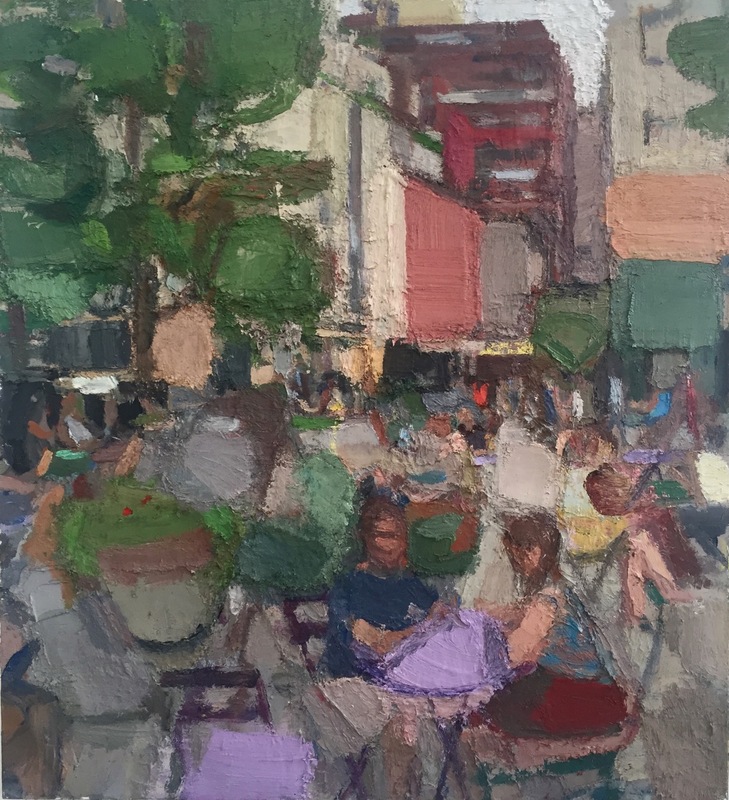 There’s both an incredible connectedness in the volumetrics of form and space and, conversely, an abrupt disconnection at times where he has chosen to paint with sudden shifts of detail and sensibility, dependent on aesthetic whim. The overall-ness of the paint quality is truly remarkable, not just because it was painted in the 1570s- Titian had learned some of that from the younger Tintoretto, but what he had done with it, Tintoretto had never of dreamed of. Titian foreshadows late Cezanne. One of the most convincing passages of form is the strange, awkward, kneeling Apollo on the left, whose arm, in a V of course, has a weight and density to it that seems to not be a painted thing, but real, as real as the air in this painting. And underneath that arm there is a cavity of space. It’s one of the only areas where Titian has carved out a hollow volume – it seems so at odds with the compression everywhere else. The tension of compression coupled with chromatic and pictorial fracturing is palpable; this picture is going so far into pure painting, and by doing so has taken on a deeply spiritual component. There’s a sense these figures in the woods, performing this strange and gruesome activity, calmly and methodically, will always be there. They will always be performing this ritual, suspended in time, not unlike Titian’s hand and mind as you follow his improvisatory paint surface and shimmering light and feel him completely and utterly there. And perhaps the most remarkable thing about the painting – with its surface tension so taut, so like a skin of paint on the rough linen – is that, as Apollo and his crew are flaying Marsyas’s hide, somehow Titian through suggestion or identification is able to conjure up the sensation that the painting surface is also being flayed. The Flaying of Marsyas has always seemed so singular that it was stunning for me this summer to see a painting that his teacher Giovanni Bellini painted 60 years before. In the Drunkenness of Noah, Bellini uses many of the same elements that are present in Titian’s Marsyas and evokes a similar kind of enchanted quality, a silence deep in the woods, an event we stumble onto and become part of by witnessing. 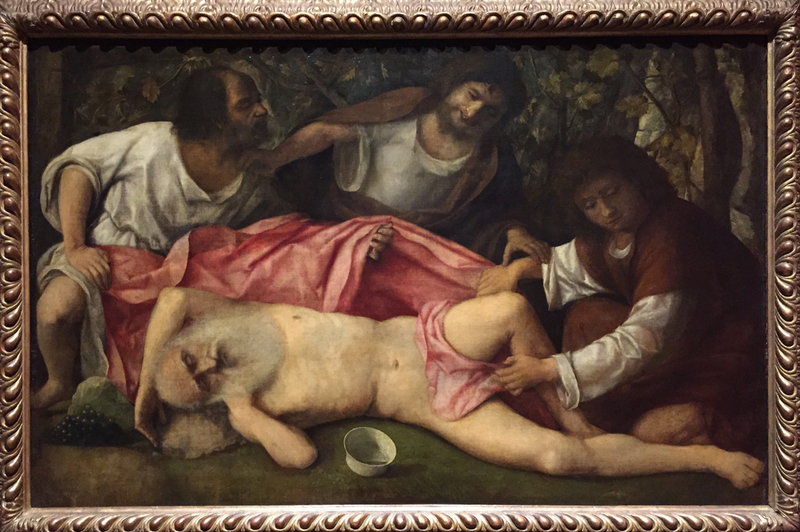 The frontality of Noah in this earlier painting coupled with the sensation of looking down on him in his passed-out nakedness makes him even more vulnerable than Marsyas. There is less emotional remove in the Bellini; it’s less about the act of painting. I assume that the young Titian had seen this painting in Bellini’s studio, even though at that point they were competing artists in Venice for the commissions of public and private pictures, an old man and his former student, whose painting studios were not far from each other. It’s all conjecture on my part, but the similarities seem to me undeniable. I wonder if this strange and uncharacteristic Bellini painting, which is perhaps his very last work, might have lodged in Titian’s mind and years later served as a catalyst for one of his own last and strangest paintings.